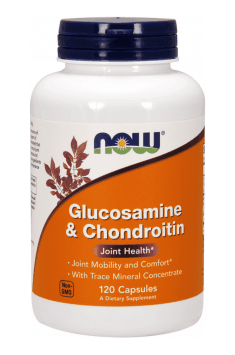 Glucosamine & Chondroitin are naturally occurring structural components that have recently enjoyed growing popularity. Glucosamine is an amino sugar derived from the chitin of shellfish and is used by the body to support healthy joint structures. Chondroitin complements Glucosamine and works synergistically to provide optimal nutritional support. Glucosamine & Chondroitin 120 caps. It is recommended to use in elderly patients and athletes, because these groups are at increased risk of micro-injuries, fractures and injuries, and it is important to take care of the proper functioning of joints. Gelatin (capsule), magnesium stearate (of vegetable origin) and silica. It contains ingredients obtained from crustaceans (crabs, shrimps, lobsters, crayfish). Contains optimal portion of high bioavailability iodine. Supports functions of thyroid.